Oversee and manage every stage of distribution. SalesPad Desktop is the ultimate tool for distribution and manufacturing companies. Process orders more accurately and efficiently while having full visibility into each step of your workflow. Simplify the lives of your customer service and sales reps by putting information at their fingertips with powerful Excel-style searching. Learn more about SalesPad Desktop's full front-end order entry, purchasing, sales, and inventory management capabilities. The complete package for distribution and manufacturing companies, SalesPad Desktop fully integrates with Microsoft Dynamics GP. Complete the form to start download. 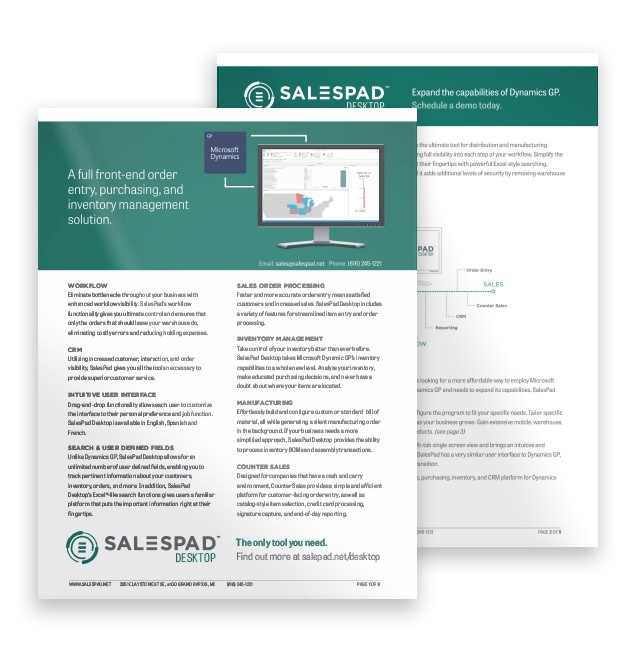 Get your copy of the fact sheet now and see how SalesPad Desktop can help your business.